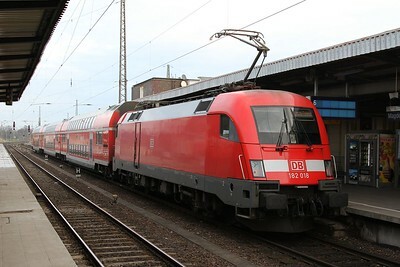 182 018 at Magdeburg Hbf with RB17709, 10.04 Magdeburg Hbf - Dessau Hbf (19.12.2015). 01 509 leaving Leipzig Hbf with DPE62150, 12.52 Leipzig Hbf - Dresden Hbf (via Döbeln Hbf) (19.12.2015). 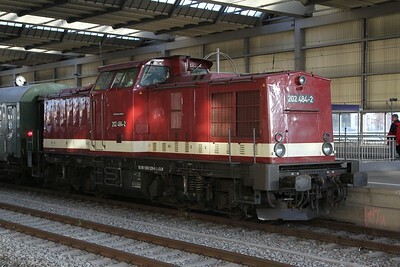 223 055 freshly-painted into Mitteldeutsche Regiobahn livery stands under the overall roof of Leipzig Hbf at the head of MRB74777, 1320 Leipzig Hbf - Chemnitz Hbf (19.12.2015). 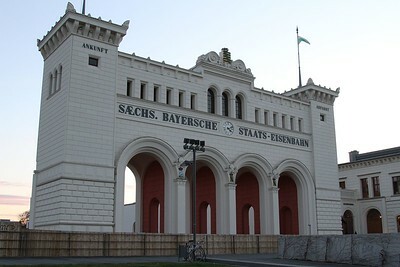 The beautifully-preserved portico of the original Leipzig Bayerischer Bahnhof which has the excellent Gose brewpub in the adjacent building (19.12.2015). 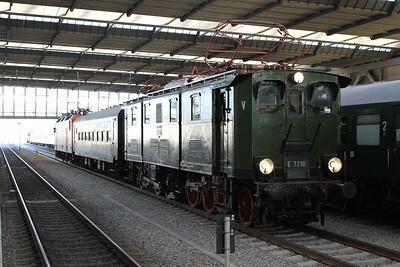 No old DR traction left at Döbeln Hbf these days, just a modern 642 dmu on a local service to Leipzig Hbf. 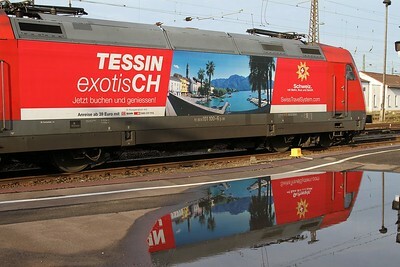 From the last timetable change there is no longer any service from Döbeln to Meissen-Triebischtal (20.12.2015). 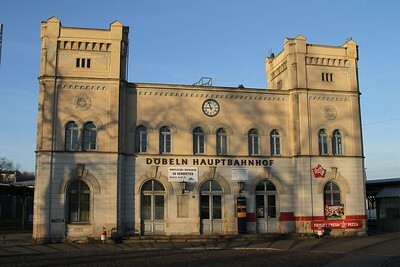 Döbeln Hbf still retains an impressive station building.......somewhat under-used these days (20.12.2015). 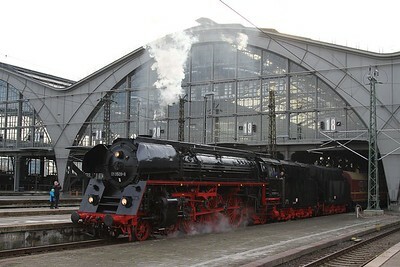 50 3648 at Chemnitz Hbf with DPE62200, 08:00 Dresden - Annaberg-Buchholz unt. Bf. (20.12.2015). 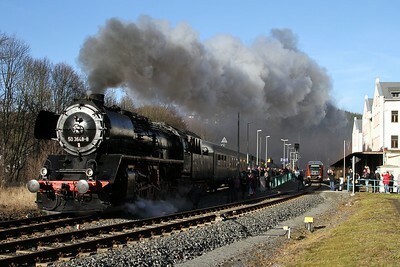 50 3648 departing from Annaberg-Buchholz unt. Bf. 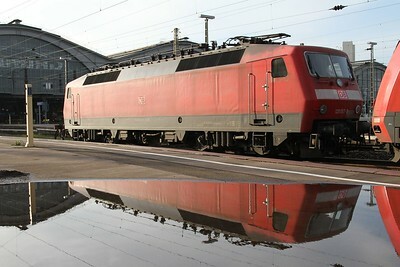 with the ecs of DPE62200, 08:00 Dresden - Annaberg-Buchholz unt. Bf. 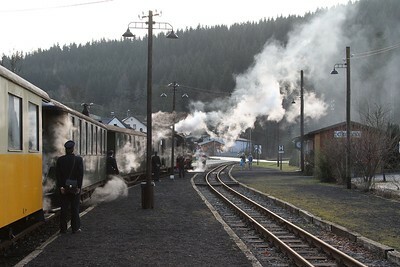 which will stable at Cranzahl (20.12.2015). 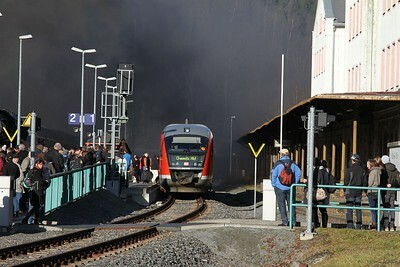 99 1715 complete with Santa arriving at Schmalzgrube with 13:00 Steinbach - Jöhstadt (20.12.2015). 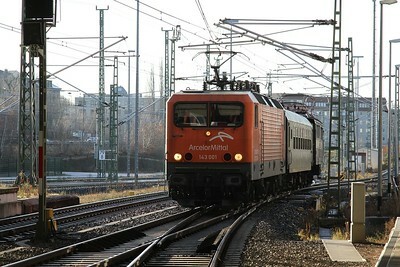 99 1715 storms uphill from Schmalzgrube with 13:00 Steinbach - Jöhstadt (20.12.2015). 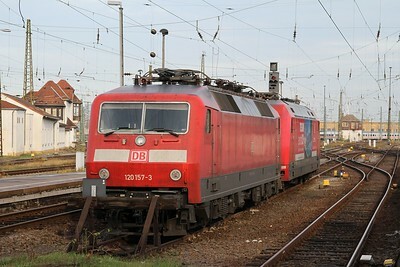 182 018 at Leipzig-Connewitz with S2 37234, 12.23 Leipzig-Connewitz - Delitzsch unt. Bf. 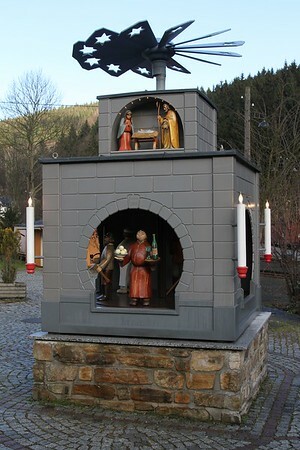 (19.12.2015). 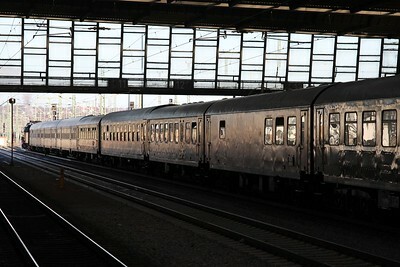 120 157 and 101 100 stabled at Leipzig Hbf (19.12.2015). 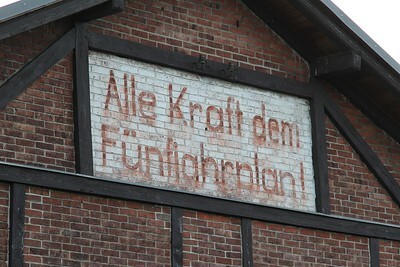 Old DDR slogan ("Give all your strength to the 5-year plan!") 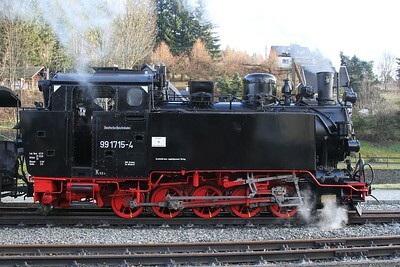 still survives on a goods shed at Bad Lausick (19.12.2015). 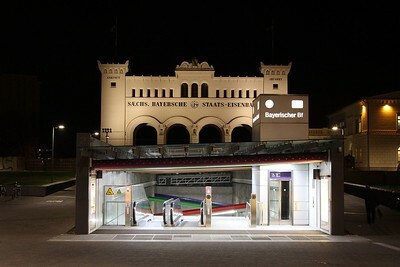 The not-quite-so-beautiful entrance to the new underground station at Leipzig Bayerischer Bahnhof. There was originally a turntable on this spot (19.12.2015). 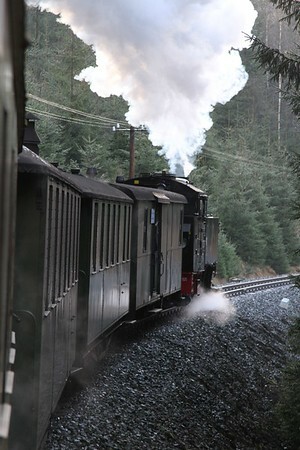 Hang on.........an unsuspected surprise in the form of 03 2155 heading back to Bw Nossen with a support coach (20.12.2015). 143 001 and E77 10 shunting at Chemnitz Hbf after bringing the tour from Dresden Hbf (20.12.2015). 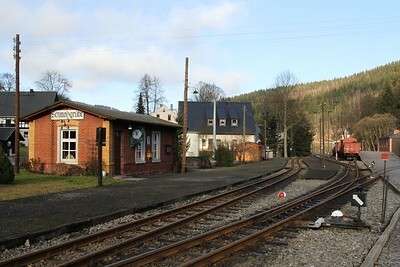 Schmaltzgrube station on the narrow-gauge Pressnitztalbahn (20.12.2015). 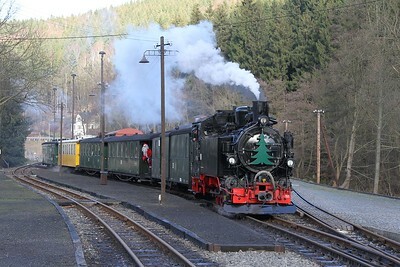 99 1715 complete with Santa stands at Schmalzgrube with 13:00 Steinbach - Jöhstadt (20.12.2015). 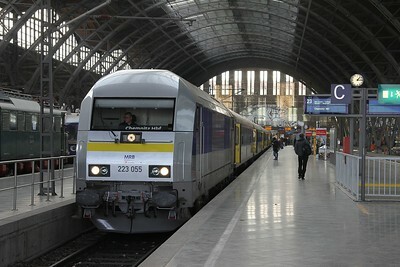 182 018 at Leipzig Hbf (tief) with S2 37234, 12.23 Leipzig-Connewitz - Delitzsch unt. Bf. 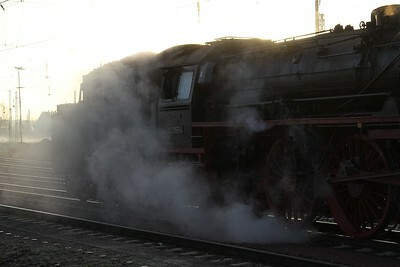 (19.12.2015). 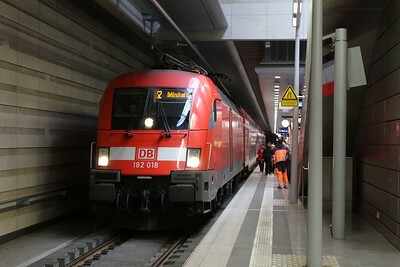 223 144 freshly-painted into Mitteldeutsche Regiobahn livery stands under the overall roof of Leipzig Hbf after arrival with MRB74780, 1331 Chemnitz Hbf - Leipzig Hbf (19.12.2015). 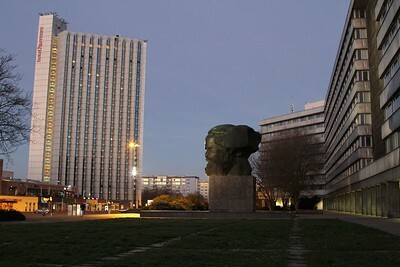 Early morning with Karl Marx in Chemnitz (20.12.2015). 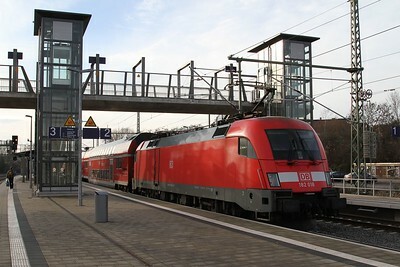 03 2155 at Döbeln Hbf heading back to Bw Nossen with a support coach (20.12.2015). 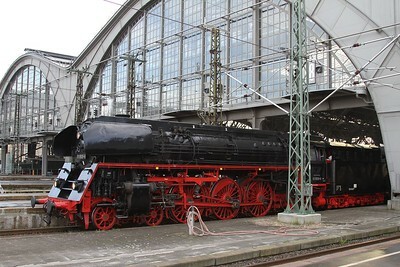 202 484 backing onto a railtour at Chemnitz Hbf (20.12.2015). E77 10 (277 010) and 143 001 shunting at Chemnitz Hbf after bringing the tour from Dresden Hbf (20.12.2015). 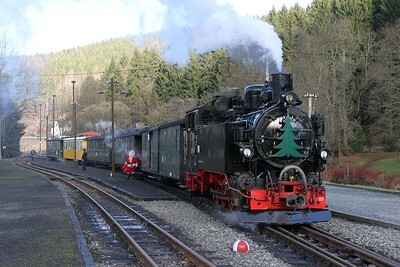 Typical Erzgebirge Christmas decorations adorn Schmaltzgrube station on the narrow-gauge Pressnitztalbahn (20.12.2015). 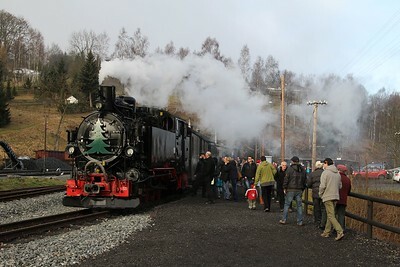 99 1715 stands at Schmalzgrube with 13:00 Steinbach - Jöhstadt (20.12.2015). 01 509 at Leipzig Hbf with DPE62150, 12.52 Leipzig Hbf - Dresden Hbf (via Döbeln Hbf) (19.12.2015). 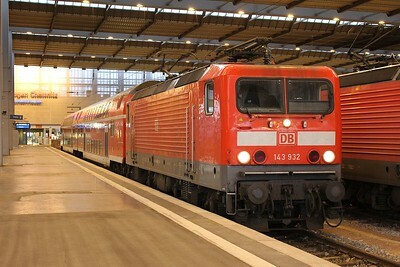 120 157 stabled at Leipzig Hbf (19.12.2015). 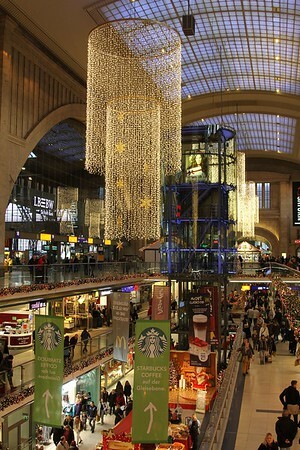 Christmas is in full swing at Leipzig Hbf (19.12.2015). 143 932 standing at Chemnitz Hbf with RB26158, 08:09 Chemnitz Hbf - Elsterwerda (20.12.2015). 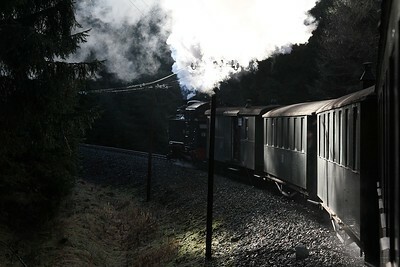 03 2155 steams away from Döbeln Hbf heading back to Bw Nossen with a support coach (20.12.2015). 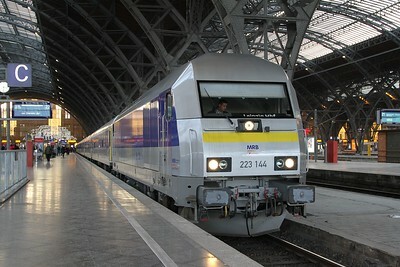 202 484 at Chemnitz Hbf on the rear of DPE62200, 08:00 Dresden - Annaberg-Buchholz unt. Bf. (20.12.2015). 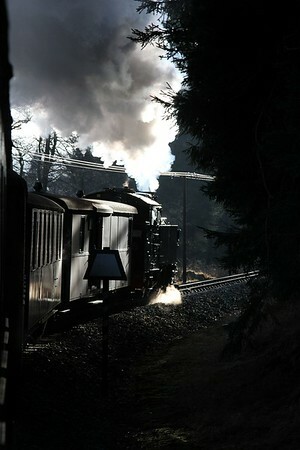 A DB 642 disappears under the exhaust of 50 3648 at Annaberg-Buchholz unt. Bf. 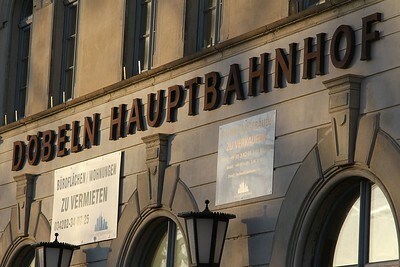 (20.12.2015). 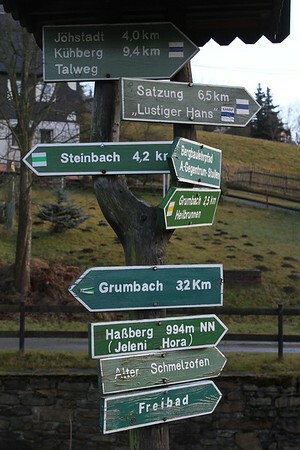 Trekking still possible in the week before Christmas........or a session in the local "Freibad" (open-air swimming pool) - Schmalzgrube (20.12.2015). 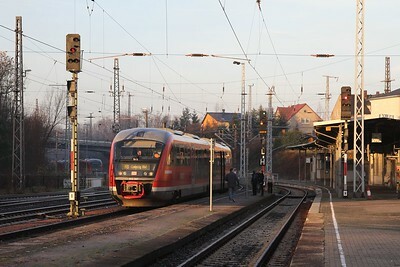 99 1715 stands at Jöhstadt after arrival with 13:00 Steinbach - Jöhstadt (20.12.2015).